Thanks to my husband for acquiring this postcard image via Ebay. It shows the western end of High Street by Brentford Bridge (and a person wearing a curiously striped costume exiting left). 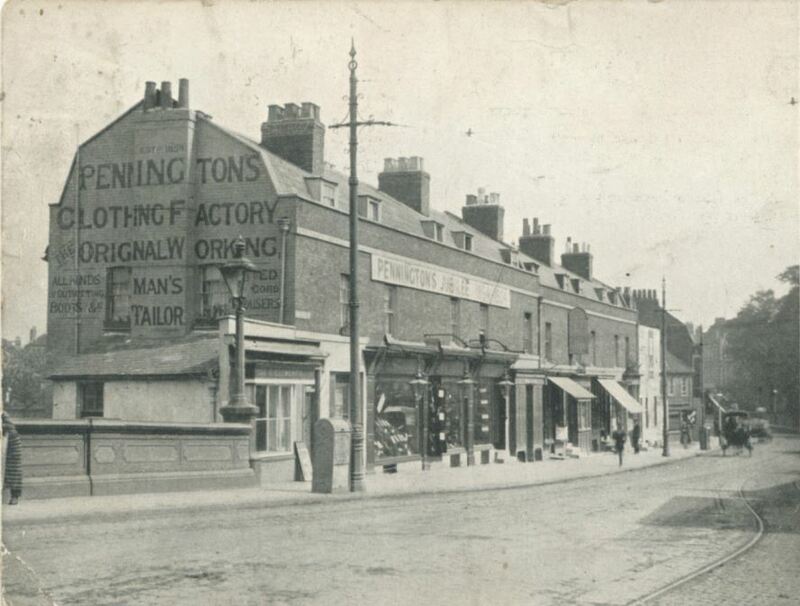 Pennington's (the 'Original Working Men's Tailor') celebrated their 50th anniversary in 1904 and painted the prominent advertisement on the side of their property to commemorate the fact - a postcard sent in 1903 shows just plain brickwork. Later they painted the wall in white and relettered the sign so it was even more prominent. G Clements shop at 159, the single storey building by the bridge, was a fishmongers and the gravestone-shaped sign beyond Pennington's jubilee banner marks the Grand Junction Arms beerhouse at 166 High Street. Read more about the history of the properties shown. Search for Pennington on the home page for links to other images of this area and notes about the Pennington family.